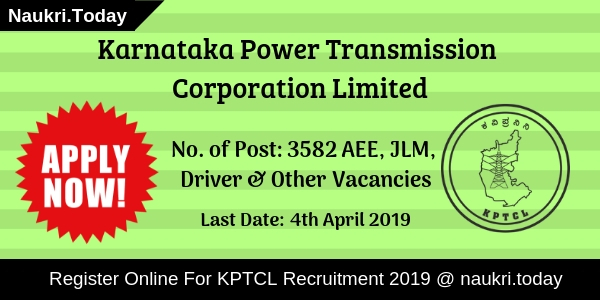 Employees’ State Insurance Corporation has released notification for recruiting aspirants on Upper Division Clerk & Stenographer Posts at various States. 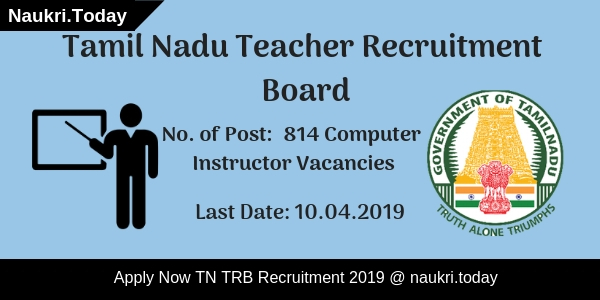 There are 1163 Vacancies are provided for ESIC Recruitment 2019. Interested candidates may fill up their application form from 03 January 2019. the Online Registration process will take place up to the last date that is 15 April 2019. Higher Secondary or Degree Pass out student can participate in ESIC Vacancy 2019. The department has set Rs. 500/- as an application fee for all categories except SC/ST/Ex-Serviceman/PWD Candidates. They need to pay only Rs. 250/- for a registration fee. For more information candidates should read below article carefully. For Stenographer Posts: Candidates must be Higher Secondary Pass from any recognize Board. Participants must have ability of typing 80 words per minutes of English & Hindi Language. Working Knowledge of Computer such as office suites & database. For UDC Posts: Applicants should have Degree from recognize university. Working Knowledge of Computer such as office suites and Database. Age should be calculated as on the closing date 15 April 2019. The Department will pay salary to the selected candidates as per 7th Central Pay Commission which is Level-4 of Pay Matrix. The Candidates will get Rs. 5200/- Rs. 20200/- for ESIC UDC Jobs 2019. For more details, candidates should check official notification of ESIC Bharti 2019. 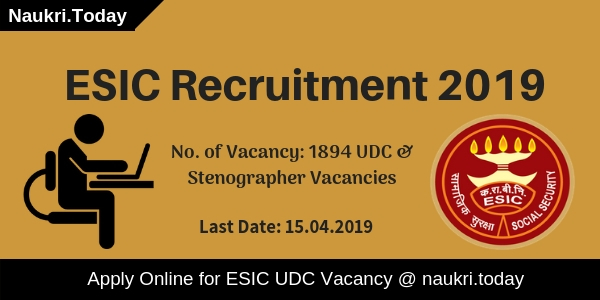 How To Apply for ESIC UDC & Stenographer Recruitment 2019? Log on to the official website of Employees’ State Insurance Corporation i.e esic.nic.in. After that click on Recruitment option given at the Homepage. Now Click on Advt. PDF as per state and read it carefully. Eligible candidates may fill up their online application form. After that Pay your application fee through online mode. Must keep a copy of an online form for feature use. Conclusion: Employees’ State Insurance Corporation has published notification for appointing candidates on 1849 UDC & Stenographer Vacancies. Candidates should check here eligibility criteria for ESIC Recruitment 2019 before applying. applicants must apply online for ESIC Jobs 2019 before the last date 15 April 2019. Hello Friends, are you waiting for ESIC Recruitment 2019? If yes then here is great opportunity for you. Employee State Insurance Corporation has issued notification for 470 Staff Nurse, Pharmacist & Other posts. Candidates who are eligible and interested can apply through online mode. Online registration for ESIC Karnataka & Maharashtra Jobs are starting from 22.12.2018. Applicants must submit their complete filled form before or on 21.01.2019. To get more details regarding ESIC Jobs 2019, Aspirants may read the given article carefully. Applicants who are going to apply for ESIC Recruitment 2019 must have Degree in Science from any recognized University. Candidate should have completed graduation from affiliated institution for ESIC Staff Nurse Jobs 2019. Participants must also have required experience at least 2 years of experience in relevant field for which they are filling application form. For more information regarding education qualification contenders must check official notification of ESIC Pharmacist Jobs 2019. Candidates who have applied online for ESIC Karnataka & Maharashtra Jobs must have minimum age as 18 years. For more details related to age read the table as given below. Upper Age Relaxation Scheme is also application for Reserved category candidates. Relaxation is given as per government rules and regulations. Candidates will be selected on the basis of written examination. Department will going to organize written test for applicants who have filled online forms for ESIC Recruitment 2019. Participants who get qualify in written exam will called for the interview session by the department. After that selection of the aspirants will be on the basis of marks obtained in exam and performance during interview. For more information regarding selection criteria candidate may check ESIC notification either from here or from official website. You can also download official notification of ESIC Pharmacist Recruitment 2019 from the link given below at the end of the article. Department will pay great amount of salary to the candidates who are selected for ESIC Recruitment 2019. Here post wise details are available for ESIC Staff Nurse Vacancy 2019. For more details regarding pay scale for ESIC Staff Nurse, Pharmacist & Various Jobs, Applicants must download ESIC Notification from the link given below. Those participants who are filling online examination form have to pay application fee for ESIC Recruitment 2019. Candidates who belongs to General/ OBC Category have to pay Rs.500/- as registration fee. Similarly, aspirants who belongs to reserved category SC/ST/ PWD/ Ex-Serviceman/ Female Candidates need to pay Rs.250/- as examination fee. To get rest of details relevant to ESIC Application Fee must read official notification from the link given below. Applicants who wish to fill application form must apply online before last date i.e. 21.01.2019. Read the following steps to follow while filling online registration form for ESIC Vacancy 2019. Firstly, Candidate should logon to official portal of ESIC. Then click on “Recruitment” option & Search for ESIC Notification. Click on notification & read it very carefully. Afterwards eligible participants click on “Apply Online” link. Fill required details in ESIC Recruitment application form. Then upload scanned image and signature in registration form. Recheck all entries filled by you in application form. At last, Make payment of application fee. Participant can also take print out of application form. Conclusion: Employee State Insurance Corporation has published an advertisement for 470 Staff Nurse, Pharmacist & Other posts. Candidates must fill application form for ESIC Recruitment 2019. Last date to submit online registration form is 21.01.2019. Candidates those who are interested in jobs of ESIC JE Recruitment 2018 check the eligibility criteria from here as given below. Eligibility criteria include the details of the minimum qualification and age criteria for ESIC Delhi Bharti 2018. The Department needs the Degree or Diploma Certificate from the recognized University for ESIC Vacancy 2018. Applicants should also have the two years of experience in their stream for ESIC JE Jobs 2018. For more information candidates can check the ESIC Delhi Jobs 2018 Notification as given below. Maximum age of the candidates will be 30 years old for ESIC Vacancy 2018. The institution also provides relaxation in age for reserved categorized applicants as per government policy for ESIC Junior Engineer Bharti 2018.
upper age relaxation is only applicable to SC/ST/OBC/PWD/Ex-Serviceman. Applicants will be getting the nice pay band to the selected candidates for ESIC Bharti 2018. The Department giving 35,400/- per month for ESIC JE Vacancy 2018. Candidates who belong to General or OBC category have to pay Rs 500/- as examination fees for ESIC JE Jobs 2018. For reserved category SC/ST/PWD/Departmental candidates/Female candidates /Ex-Serviceman and Other Reserved category have to pay 250/- as examination fee for ESIC Junior Engineer Recruitment. Candidates can get further information through official notification of ESIC Jobs 2018. Applicants those who want to fill online form for ESIC JE Jobs can check the simple steps as given below. First of applicants visit the official website i.e. esic.nic.in. Applicants go on the home page and search for ESIC Recruitment 2018 notification. Then click on ESIC Junior Engineer Vacancy 2018 official link. Read all the information from ESIC JE Bharti 2018 notification properly. Candidates who are eligible for must click on apply online. Fill all the necessary information in the online form. Candidates must upload the recent passport size photo,signature and scanned images of all relevant documents in the online registration form. Now deposit the application fee and click on submit button for submission of form. Take print out of application form and don’t forget to save register id and password for future use. Dear Applicants, If you are searching ESIC Recruitment 2018 Notification, then you visit a right place. Employee’s State Insurance Corporation, New Delhi has published an advertisement for employment of 771 Medical Officers Posts. Those applicants are interested in ESIC IMO Vacancy 2018 must fulfill eligibility criteria also. The registration of ESIC Delhi Recruitment is available through online mode only. Candidates can fill the online form from 12.10.2018. The last date to apply online for ESIC Jobs 2018 is 10.11.2018. Furthermore, like eligibility criteria, application fees, selection process and how to apply for ESIC Insurance Medical Officer Recruitment 2018? is mention on below. Applicants those are want to apply for ESIC Recruitment 2018 must fulfill eligibility criteria also. The details of education qualification, age criteria is included in eligibility criteria. So, applicants, those are want to apply for ESIC IMO Vacancy must check given below conditions. Applicant those are going to apply for ESIC IMO Job must register with the Medical Council of India. Candidates also complete Medical qualification include the first or second schedule. For more details check the official ESIC notification. The upper age required for ESIC Vacancy is 30 years as on 10.11.2018. Maximum age relaxation is also applicable for ESIC Employees 05 years. Upper age relaxation also applicable for SC/ST/OBC & other candidates as per govt. norms. Participants those are going to apply for ESIC IMO Job also require to pay application fees. Those candidates are belonging to unreserved male category have to pay Rs. 500/-. Therefore, SC/ST/PWD/Departmental Candidates/Female Candidate/Ex-Serviceman need to pay Rs. 250/-. Fees of ESIC Job will pay through online mode only using net banking/Credit card/Debit Card. Those candidates are selected for Insurance Medical Officer Vacancy will receive a salary after selection. Applicants will receive salary as per Level –9 as per 07th CPC. Pay Matrix will be Rs. 53100/- to Rs. 167800/-. Selection of the candidate for ESIC Recruitment will be made on the basis of written examination and personal interview. interested and eligible candidates first fill the online form till on 10.11.2018. After that, they will call for Written Examination. In the examination, there will be 200 questions and the marks will be 200. After that, written exam qualified candidates will call for personal interview. The marks of the interview will be 200 marks. Applicants can check fill examination scheme & syllabus on ESIC IMO Exam Syllabus. Participants who wish to apply and eligible also for ESIC Recruitment 2018 may apply through online mode. Before going to fill online form you must have valid email id and mobile no. Candidates also have scan copy of all required documents. Now follow some instructions to apply for ESIC IMO Vacancy 2018. First of all, go to the official site esic.nic.in. Click on the link download ESIC Notification. Download it and then read full advertisement carefully. After that, click on the link Apply Online for ESIC Vacancy. Enter all required information on your application form. Upload all required documents on it. Now make payment of Application fees of ESIC Recruitment 2018. Recheck full form and then submit it carefully. Take the hard copy of it for future uses. Conclusion: ESIC Recruitment 2018 for 771 Insurance Medical Officer Vacancy. Apply Online from 12.10.2018. The last date of registration for ESIC IMO Medical Officer Recruitment is 10.11.2018. Read full information on the above article.